Creativity and innovation are at the heart of Compass Box, continuously challenging the way it's always been done. The Spice Tree, first released in 2005, is the perfect example of this. John Glaser sourced the highest quality French Oak he could get his hands on and had them cut into inner staves for his barrels for secondary maturation. The quality of the finished product was overwhelmingly received by all but the Scottish Whisky Association. They put tradition above quality and legally challenged the Spice Tree as a legitimate Scotch whisky product. 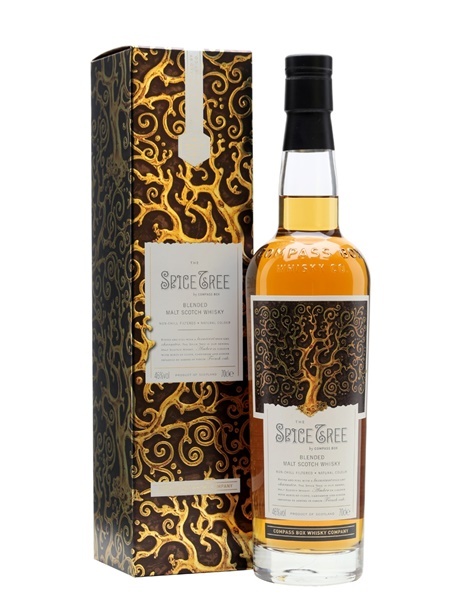 The Compass Box were forced to withdraw The Spice Tree from the market. But the story didn't end there. I did say creativity and innovation! Through further innovation, the Compass Box turned the toasted, high quality, French oak into cask heads creating a new hybrid cask. Thankfully, this has enabled a return of The Spice Tree (~€55) to the shelves. It's a blended malt, natural colour, non-chill filtered and bottled at 46% ABV.